Did y'all have a nice weekend? For the most part it only rained here during the night, so we were able to spend a lot of time outside - grilling, playing and even for a little outing yesterday to a Mexican restaurant for lunch. We both ate so much, neither of us had dinner...now that is saying something. 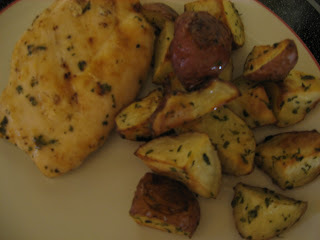 We also grilled one of our favorite easy meals on Saturday - marinated chicken and roasted potatoes. For today's recipe, this is one I made last week for the farmer's market. Nothing better than picking up an individually wrapped cookie at the market for a small (or big) snack later, right? Cream butter, sugar, eggs in a mixer until fluffy. Add other remaining ingredients (minus the 2 T. sugar and 2 t. cinnamon) and combine. Refrigerate for 30 minutes. Preheat oven to 375 degrees. With a large spoon or ice cream scoop, form into 2 inch balls. Roll in cinnamon/sugar mixture and place on greased baking sheet. Bake 12-15 minutes or just until golden. Cool on wire rack. Do not over bake - these are much better a little chewy than crispy. Ta da! An easy cookie for your family, a bake sale, etc. as they hold up well, when wrapped individually in plastic wrap. I never said these were healthy...so don't dog me on the ingredients! It didn't matter to me though...I'm selling them to other folks, so they can get fat. They look like great cookies. I like healthy versions of things, but real cookies are far better. My mom showed up with a huge batch of choc chip this weekend and they didn't last long. I read cookbooks all the time, I need to see all the recipes to figure out which ones I want to make. Oh, wow! I love snickerdoodles and these look yummy!! I love to read cookbooks! I think they are so much fun! And....blueberries are a favorite with my kiddos too! They could eat them for hours! I love reading cookbooks! Snickerdoodles are wonderful...thank you for the recipe! 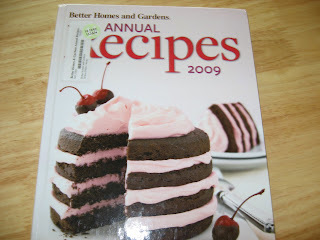 My husband always makes fun of me because I read cookbooks like fiction! I tell him I am not the only one! Snickerdoodles are my favorite cookie - love how they are slightly crisp on the outside and chewy in the middle! Your son is so fricken cute - I want to kiss his cheeks! The grilled potatoes look awesome! 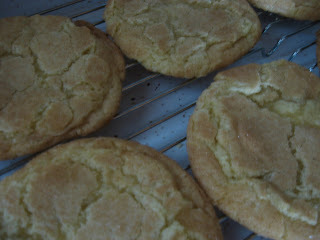 The snickerdoodles, well, I just had to look away fast because seriously just looking at them will make me fat! My favorite! Yeah, if I could make a living reading cookbooks I'd be a millionaire! Your son is so cute. One thing I used to do in the summer when my kids were little, is give them a cup and a bowl of icecubes. 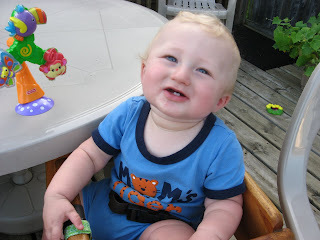 They loved picking up the ice cubes, putting them in the cup or just playing with them in their high chair. It was great! And if it was hot out, it was even better! my boys LOVE blueberries...i give my 1 yr old frozen ones for his teeth, but i bought fresh ones on thursday night and both pints were gone by sat! I can read cookbooks cover to cover! I absolutely love them. Glad your little man discovered the beauty of blueberries! Hooray! I made snickerdoodles last Christmas for everyone in our family. I LOVE them! So good! Your little man is adorable but I think I say that everytime haha! The squirrel hated blueberries for the longest time (I think it was the texture) but this past summer she has eaten them almost everyday! i dont' even know what snickerdoodles taste like but i have always wanted to make them. that recipe seems totally simple and the outcome looks delicious! When I found the library in Ankeny the first things I checked out were Ina Garten cookbooks. Right now I'm reading the Pioneer Woman cookbook. There's something very soothing, inspirational and obviously mouthwatering about reading recipes and looking at photos of food.